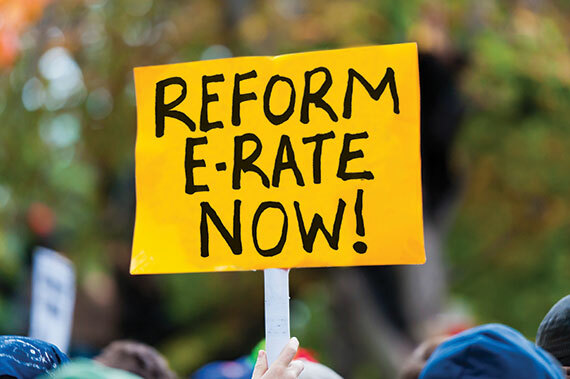 E-Rate Reform Is 'Going to Happen.' But How? The first steps toward comprehensive E-Rate reform have already been taken. What should schools expect? This article originally appeared in T.H.E. Journal's September 2013 digital edition. The publication of the 175-page NPRM marked the beginning of what could be the most extensive overhaul ever of the program most responsible for helping K-12 schools and libraries access modern communications networks. The authors of the NPRM note that since E-Rate was created in 1996, it "has been instrumental in ensuring our schools and libraries have the connectivity necessary to enable students and library patrons to participate in the digital world." But the program has changed surprisingly little over the years, especially when compared with the technologies it supports. Increasingly, schools and libraries require high-capacity broadband connections to take advantage of digital learning technologies that hold the promise of substantially improving educational experiences and expanding opportunity for students, teachers, parents and whole communities. As a result, there is a growing chorus of calls to build on the success of the E-Rate program by modernizing the program and adopting clear forward-looking goals aimed at efficiently and effectively ensuring high-capacity connections to schools and libraries nationwide. Tom Koutsky, chief policy council at Connected Nation, would count himself among that chorus. He worked for the FCC prior to joining Connected Nation, a 10-year-old nonprofit focused on expanding access to broadband and related technologies. While at the FCC, he served on the team that authored the National Broadband Plan. Koutsky is his organization's policy lead on FCC and congressional affairs in Washington, DC. T.H.E. Journal caught up with him moments after he left that July FCC meeting. "E-Rate was very successful in getting schools initially connected to the internet," he says. "But over the past 17 years, the commission hasn't kept up to date with regard to the services E-Rate helps to fund. The result is that we have a scattershot outcome. Some schools are very well connected with significant bandwidth coming in, but the vast majority of schools still have very basic levels of connectivity today that are essentially much slower than the typical household has. The significance of what happened today is that [the FCC] reestablished some priorities in the program. This meeting made it clear that the goal of E-Rate is to support faster broadband connectivity." Part of the process of getting E-Rate focused on broadband is likely to involve shedding its support for fading technologies and outdated services. "E-Rate has been paying for a panoply of telecom services that just don't support the educational mission of most schools and libraries," Koutsky says. "Pagers are probably the most egregious, but we need to think about why the program is supporting dial-tone services, cell phones, etc. The question we have to answer is, 'Are those things a priority?' When we have a national priority to get much higher broadband connections to schools, does E-Rate need to be paying for pagers?" Last year, the E-Rate program's administrator organization, Universal Service Administrative Company, committed approximately $934,000 to paging services, according to the FCC. Directory assistance services are also eligible for E-Rate support, as are such custom telephone features as inside wiring maintenance plans, call blocking, 800-number services, and text messaging. The FCC proposes to eliminate support for these services in the NPRM. To be fair, some of these were hot technologies when the E-Rate program was created nearly two decades ago. Only about 14 percent of K-12 schools in this country were connected to the nascent internet at that time, and most of those were connected at dial-up-level speeds. Today the percentage of connected schools is closer to 94 percent, but many of those connections simply aren't fast enough to keep up with the demands of increasingly bandwidth-hungry digital learning systems and technologies. In fact, in the NPRM, the FCC points to a 2010 FCC survey of E-Rate funded schools and libraries in which "only 10 percent of survey respondents reported broadband speeds of 100 Mbps or greater, while 48 percent reported broadband speeds of less than 10 Mbps. Approximately 39 percent of the respondents cited cost of service as a barrier in meeting their needs, and 27 percent cited cost of installation as a barrier." A very public supporter of fast internet connections to schools, President Obama has thrown his support behind E-Rate reform. In June he unveiled ConnectED, an initiative that aims to connect 99 percent of America's students to the internet through high-speed broadband and high-speed wireless within five years. A month later, shortly after the FCC published its NPRM, the president issued a supporting statement, essentially suggesting that efforts to modernize the E-Rate program are in line with the goals of ConnectED: "[W]e look forward to the next steps in this effort," he said in the statement. Such an endorsement from Washington could have a real impact, Koutsky said, because national priorities can move private markets. "E-Rate doesn't pay for tablets or software or laptops," he says. "By establishing this as a national priority, the private sector will know that a large market is opening up for distance and digital learning. That will incent the private sector to develop apps, tools, software, and devices that will utilize those faster connections, and feed into this evolving educational technology market." SETDA's deputy executive director, Geoffrey H. Fletcher, sees the unfolding of what has been called "E-Rate 2.0" as a response to changing times and technologies. "This is something that has been brewing for some time," he says. "It follows the National Broadband Plan, of which education was a big part. I think there's a lot of momentum behind it. This is a terrific opportunity, and I believe the commissioners truly understand that. I mean, they haven't taken such a comprehensive look at this program…ever." If nothing else, the sheer size of the NPRM underscores the FCC's seriousness in this matter, Fletcher argues. He also points out that, although broadband is taking center stage in the conversation, the FCC is also aiming to modernize in other areas. "Modernization of E-Rate is not just about bandwidth," he says, "but a range of things. It's about the administration of the process and bringing it into the current decade. It's about how to deal with recurring costs, how to support things like multiyear purchasing, how to improve electronic filing and use the data that generates. It's about getting WiFi into the schools, looking at the internal connections, not just the line to the schoolhouse. And it's about finding ways to make the program more equitable." The E-Rate program subsidizes a range of services with fees collected from telecom companies, much of which is recovered from consumers via the "Universal Service" line item on their telephone bills. The program is capped at $2.25 billion, which is about half the funding that was sought by schools and libraries in 2013. According to the FCC, demand for services has exceeded the E-Rate cap every year since the program was started. "There's a $2.5 billion gap," says Brian Lewis, CEO of the International Society for Technology in Education. "And the NPRM gives us an opportunity to talk about that gap. The reality of our world has changed. This isn't a textbook world anymore. If we're going to set high expectations for our districts and students, as we rightfully are, we have to be willing to equip them with the resources they need to meet those expectations. So there really shouldn't be any question that we should do what we can to update a program that's 17 or 18 years old and make sure that's it's structured the way it should be. And funded the way it should be." John D. Harrington agrees. During a recent webinar, Harrington, the CEO of Funds for Learning, an E-Rate consultancy that works with schools, noted that in the past 15 years, demand for E-Rate-funded internet access has more than tripled, from $15 per student to $50 per student. In the NPRM, the FCC writes: "It is likely this year that only school districts with nearly 75 percent of students eligible to receive free or reduced price school lunch will receive any funding for internal connections. In future years, in fact, it is likely that requests for telecommunications and internet access services will exceed the cap, with the result that no funding for internal connections will be available for any applicants." Harrington says, "We estimate that as early as 2014, there will be no support for 47 percent of schools in America for any type of internet access," he says. "By 2015 under the current program rules, 71 percent of schools will be eliminated from receiving any E-Rate program support." The funding cap should be raised, Harrington says, but all of the additional funds wouldn't necessarily have to come from an increase in the fees consumers currently pay on their phone bills. E-Rate is one of four Universal Service Support programs, and it accounts for about a quarter of the money gathered in that program. One approach would be simply to reallocate those funds. The Connect America Fund, for example, is a Universal Service fund designed to extend broadband to high-cost areas, rural communities. Adding those funds to the E-Rate funds could further the overall policy goal, he says. Among the upgrades Keith R. Krueger, CEO of the Consortium for School Networking, would like to see in E-Rate 2.0 is increased transparency around services pricing. "Since the program was enacted, telecommunications companies have been required to provide the lowest price available to schools and libraries," he says. "However, there has been no transparency around that, and we suspect that some places are getting better deals than others. We need to shine a brighter light on the costs. Additional transparency would give districts a better idea of what their neighboring districts are paying for the same types of service, putting them in a better bargaining position. Perhaps we could stretch those dollars even farther with more transparency." The FCC's decision to modernize the E-Rate program has presented educators with an unprecedented opportunity, Krueger says, and they should take full advantage of it. "It is critical that educators weigh in on the importance of modernizing the E-Rate program," he said. "We need thousands of voices. Now is the time to make that moon-shot investment in this program. If educators loudly support this vision of connecting 99 percent of classrooms with broadband within five years, if we raise our voices on how important E-Rate is, there will be the political will to make this happen. We have support from the president, and some bipartisan support from the commission, but they want to hear from educators about what's needed." Fletcher agrees: "The commissioners want data," he says. "They want to know what speed is coming into your school. They want to know whether you have copper or fiber. But they also want to hear your stories--how you had to sweep the snow off the dish before you could connect to the internet. And they want to hear about trends: If more and more school districts are moving from print to digital instructional materials and more and more are going to the internet for rich materials, you've got to have broadband to make that happen." "I don't believe we'll see big changes in one fell swoop," he adds. "But everybody is ready for a change, and it's going to happen."